Edie as a young woman. The above picture is one I tried to reconstruct from the photo below that was severely damaged by water. Unfortunately I have no other pictures of my dear great aunt Edie as a young woman so I had to try and restore the damaged one without much to go on. Edith McEwan, fifth child but first daughter born to John McEwan and Janet Stevenson came into the world August 5th 1872, Toronto, Ontario. Edith was to become a dressmaker when she became an adult. She was never to marry and remained with her parents until their death. She was a great part in the upbringing of her younger brother Benjamin’s youngest child Lily, who came to live with her grandparents when her mother died in 1911. Edie was the closest thing to a mother Lilly would know and there was an incredible lifelong bond between them. After the death of her father and until the death of her mother Edith was in the family home with two other sisters Emma and Helen (Nell) along with Lily her niece. Nell married in 1922, several years before the death of her mother Janet, but Emma only married in 1926 after her mother died, due to special circumstances. Lily also married in December of 1926, after the death of Janet. At that point the house on Saulter Street was sold to the railroad and Edith moved to her own place nearby. She would have been fifty years old at that time. At a certain point Edith came to live with Lily and her family after incurring heart problems. She would remain with them until her death. She continued to earn her keep by her trade and Llly’s children were always well dressed and cared for. 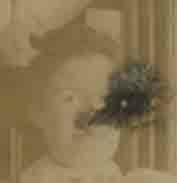 Edith died at the family cottage July 26th 1957 in South Lake, Minden, Ontario. I still remember that day. She was buried at the St-John’s Norway Cemetery and Crematorium.